What a Happy Tail! Last month we highlighted these two senior kitties who needed a family to open their home to both of them. These two 13 year-old girls found themselves at DAWS when their owner suddenly passed away. 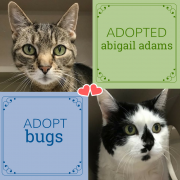 They had a lot going against them…their age and their need to be adopted together, but low and behold they found a new chance for love with a new family. A 93 year-old couple wanted to share their golden years with this sweet and loving pair. Abigail and Bugs are now living the good life with their new mom and dad, who dote on them daily. They will be well cared-for by their new parents, who have made arrangements for them to live out their entire lives in a loving home. We couldn’t be happier for these two sweet hearts.